157/365 – “I’m Batman” nr.7, a photo by Luca Rossini on Flickr. 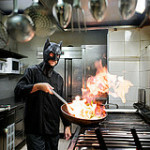 Seventh day of “I’m Batman”, here’s the cook. I’m quite fond of restaurants’ kitchens, I have half an idea to make one of the themes about them, cause they’re shiny, metallic, dimly illuminated, full of tools and action. Especially the latter, when you get to see a single cook taking care of tens of orders at the same time… You may get to the point to think “Oh my gosh, he’s going to need a super hero to get him out of his troubles”, and yet he doesn’t, maybe cause he’s the Batman. 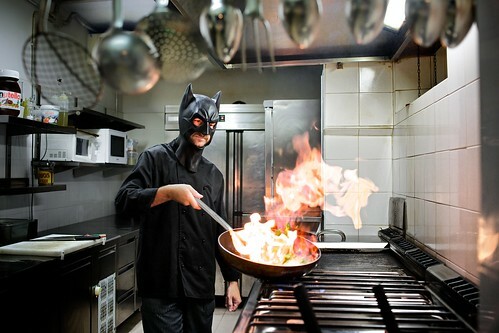 Sorry, the Bat-Cook.